Solar power capacity in the U.S. has doubled over the past few years, with new power outpacing projects. Inside Climate News reports that in 2016, solar power capacity doubled compared to 2015, with the country adding 14.5 gigawatts of solar power, far outpacing government projections. In 2006 the U.S. Energy Information Administration predicted that solar power would amount to only about 0.8 gigawatts of capacity by 2016. In the first half of 2017, wind and solar accounted for 10 percent of monthly electricity generation for the first time. Despite the growth, there are some myths holding back widespread adoption of solar power in some parts of the country. Myth: Cold winters do not make solar panel viable. Reality: Winter is here, so what does that mean for solar production? Will solar panels stop producing solar energy to power homes and businesses? The easy answer is ABSOLUTELY NOT! Solar energy is produced from sunlight – not heat. In fact, solar panels are known to perform better in colder temperatures. Solar panels, whether rooftop or ground-mounted, will be at an angle. Anytime the sun hits them, the solar panels produce energy. In the winter, sun position is lower than other times of the year and this allows solar panels to soak up as much energy as possible. Myth: Snow prohibits solar power generation. Reality: Solar panels are designed to withstand hundreds of pounds of snow during harsh winters. Solar panels have two great characteristics to rid themselves of snow without your intervention – they heat up a bit from the sun hitting them and producing energy and they’re at an angle. So, what happens on those dark days when it snows? Once the sun comes out, the snow melts, and voilà, you’re back to producing solar energy to power your home. 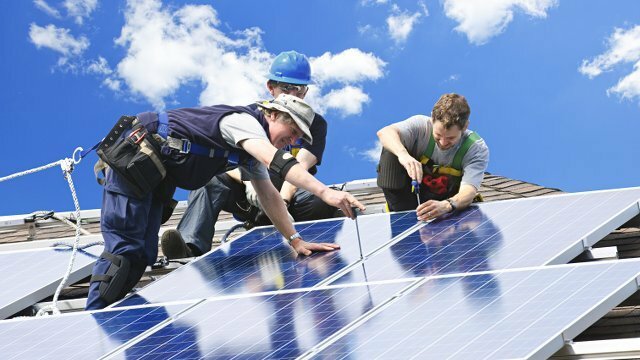 Myth: Solar panels decrease the value of your home. Reality: Solar panels tend to INCREASE the value of a home by $15,000. Myth: Everyone thinks solar panels are ugly. Reality: To many, solar panels are working art – a clean, renewable source of energy that can save our planet. For those who disagree, solar panels can be installed in locations that minimize visual impact. Myth: I won’t live in my home long enough for my solar investment to provide timely ROI. Reality: Most solar panels pay for themselves in 6 to 15 years. Combined with state and federal tax credits and incentives, many see a return on investment in 2 to 4 years. Myth: Solar panels require a lot of maintenance. Reality: Solar panels are sturdy, durable and reliable. Most installers recommend an annual inspection to maximize performance. Myth: Solar panels may damage my roof. Reality: Solar panels may extend the life of your roof by protecting it from the elements. Installed a few inches above the roof, solar panels increase air flow and weigh about as much as a second layer of shingles. Read more about home solar power.